“Pray that your flight not be…on the Sabbath day”? Is this a Hint for Christians To Keep Sabbath? Some Christians find Jesus’ mention of the Sabbath in this passage disturbing. It almost seems to be advising us to be careful to avoid trampling the Sabbath.Â For Christians, the Sabbath is a command they associate with the lost legalistic Pharisees of Jesus’ day and the non-believing Orthodox Jews today. Therefore the statement is problematic for them. On the other hand, Sabbath-keeping Christians often cite this verse as proof of their position that God expects all believers to rest on Sabbath today. “Why would Jesus tell us to pray to not have to leave on the Sabbath unless it was still a day of rest for all believers?” they ask. Well, that’s an excellent question. They probably are not going to like hearing what the most likely answer is. Yet most Christians will be glad to see how this verse’s plain meaning is in harmony with the rest of the Bible. The exercise will illustrate how many of these verses are best resolved through attention to grammatical, historical and whole Bible context. Here’s the problem with the common interpretation of this verse. Under the Old Covenant Torah, there was no prohibition against fleeing or even fighting for your life on Sabbath. The only requirement given in the Torah after Israel had entered the land was to rest from your occupational work. (When they were still in tents wandering for 40 years, they had the additional requirement of not even leaving their place; probably only to not be tempted to gather manna – Ex 16:29. See Dt 23:12-13). Therefore, the mention of the Sabbath day causing hardship has nothing to do with believers keeping Sabbath or Sabbath forbidding travel. To understand the statement, we have to understand what it meant to Jesus’ audience who he spoke it to. In Jesus’ day, their culture was to keep Sabbath. They did this not because it was required by the Old Covenant. They had broken that already. Plus, when it was in effect, prophets continually warned Israel and Judah to stop trampling on it. Yet, those prophets and their warnings ceased with the exile of Israel and Judah (similar to how the shekinah glory left the temple then in Ezekiel 10:18). Instead, they were keeping it as part of their cultural tradition and religion of Judaism that developed out of the Babylon exile. You are probably familiar with some of the many things Orthodox Judaism prohibits on Sabbath, such as ripping toilet paper, carrying money, or turning on a light switch. They had such embellishments back in Jesus’ day, too, which in several Gospel incidents Jesus is seen in conflict with them on. Examples include the washing of hands, healing or gleaning of grain in fields left for the poor on Sabbath. They even had a “Sabbath’s day journey” limit on travel (referenced in Acts 1:12 as a distance measurement). Therefore, when Jesus mentioned avoiding Sabbath in the context of the prescribed speedy flight, Jesus’ audience knew immediately what he was talking about. Travel on Sabbath was already problematic back then with the cultural restrictions. Today in the land of Israel, buses don’t run on Sabbath due to these same traditions. Mostly only Arab-run taxis are available. Therefore, it’s just plain harder to travel in Israel from Friday sunset until Saturday sunset today just as it was back in Jesus’ day. At least in the religious area of Jerusalem, or Judea this was true when I visited. Interestingly, this is the specific area Jesus said we would be gathered to and needing to flee from in the end times (Lk 21:21). Notice the context as well. Sabbath day is mentioned along with winter and pregnant and nursing women. What do they all have in common? Winter means cold and potentially bad weather that requires more clothing and preparation. It makes travel harder. Being pregnant or having small children means you must go slower or carry a child and stop to nurse him. This obviously makes emergency last minute travel much harder and slower. All these things, like the Sabbath day, present obstacles to fast, unencumberedÂ travel on short notice as will be required. This was the whole point of the context of the Abomination of Desolation warnings. If someone does not listen to the warning ahead of time about what it coming and instead waits until he sees the event happen before his eyes (“I’ll believe it when I seeÂ it”), then he will need to move so fast that he cannot even stop for supplies (Mt 24:15-20). If time is of the essence, then Sabbath day travel friction is a concern. This reference to the Sabbath is found only in Matthewâ€™s account. It would be natural for Matthew to include it for his more Jewish audience, but he does not thereby imply, as is often alleged, that he envisions Christians still keeping the Jewish laws. G. N. Stanton (â€œ â€˜Pray That Your Flight May Not Be in Winter or on a Sabbathâ€™ [Matthew 24.20],â€ JSNT 37 : 17â€“30) surveys the various options for interpreting this verse and concludes that the best approach understands that fleeing on the Sabbath would have antagonized the Jews further and increased persecution of believers. Although Palestinian winters are mild compared to those in many parts of the world, even slightly inclement weather could be a hindrance when the Antichrist begins his final aggression against God’s people. Therefore Jesus said, Pray that your fight may not be in the winter. Those seeking to escape should also pray that they will not have to flee on the Sabbath, when legalistic Jews who are not fleeing might try to stone or otherwise impede those whom they believe to be profaning the Sabbathâ€”just as their forefathers had sought to stone Jesus for breaking their Sabbath traditions. Jesus’ point was that no possession would be worth the risk of retrieving and no hindrance could be considered small. Because of the imminent unmatched terror, single-minded, undeterred flight will be the only order of the day. What Jesus is implying by his suggestion to pray about the timing of your flight is that those who make the mistake of waiting until the last minute will literally see the Abomination happen on a Sabbath day in the Winter. That may sound like an outrageous leap, but we can already confirm the Winter season for the abomination using Daniel. Daniel tells us that the Abomination of Desolation happens 1290 days from the end of the Tribulation. We know the rapture happens on the Feast of Trumpets right after the Tribulation (Mt 24:39-31). The Feast of Trumpets is on Tishrei 1, or first day of the 7th month. If you go back 1290 days or 43 months from that you end up in the 12th month of Adar. That’s the Winter! 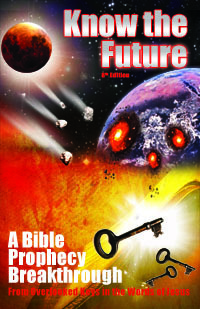 Was Jesus also telling us ahead of time that the Abomination of Desolation would happen on a future Sabbath day? I think so. Those who pray and have the faith to flee before they see the Abomination will probably flee before Winter gets bad. They can pick a time that is not on a Sabbath day as well and have an easier time. But to do this will take faith since it means leaving when everything seems fine to the eye. Whenever we read a cryptic passage like this, we have to resist the temptation to jump to the conclusion that fits in with our doctrinal view. We have to put our bias aside and put on our detective’s hat. The Bible requires clear thinking and careful research. If we start with what the passage would have meant to the person saying it and also to his audience, we have a much better chance of arriving at the correct answer. Note: If you think that by writing this article it means I do not keep Sabbath or am against keeping Sabbath, then that conclusion would be just as shaky as the one this article argued against. =) This article is not making a statement for or against keeping Sabbath. The point is only to correct a common case of taking a verses out of its context, masking its true intended meaning. The First Shall Be Last, the Last Shall Be First? Mark of the Beast: Literal or Sunday Worship? A good article Tim. My one comment is, keeping the Sabbath is not about the Judaic Law. Jesus said if you love me keep my commandments. I keep the Sabbath because I love him, and the Sabbath is a joy to keep and it pleases him that I do. Not only me but a large number and growing and we are not SDA but believers coming out of Babylon. I believe the elect who will be gathered in Judea are Sabbath keeping Christians. More than once in the Revelation they are described as those who keep the Commandments and have the testimony of Jesus Christ. The Commandments means all 10 and that includes the 4th on Sabbath. It appears to me keeping the Sabbath is what separates them from the non-elect Christians. In Rev 12:10-11 We see the other group of Christians who have the testimony of Jesus Christ but there was no mention of them keeping the Commandments, this group gave their lives in martyrdom. Satan is in Heaven accusing them before God day and night, probably saying “these are your children who willfully transgress your Law,” therefore he was granted the permission to persecute them? I believe they are the great multitude beheaded in the GT John saw in his vision “who washed their robes white.” Why wash it through martyrdom if not dirty in the first place? I’m disappointed you failed to make this point in your book. Just knowing the road map to escape the GT and what God will do to protect the elect is not enough; one must become a part of the elect, having the Blood of Jesus Christ and keeping all the 10 Commandments, not 9, to be able to escape the coming GT of the Church. I have a question. In your book you noted about the return would have to be in the Sabbath year cycle. Would this pray your flight not be on the Sabbath coincide with the descriptive outline you have regarding the Sabbath year cycle? The question is if Elijah is to arrive and gather us to Judea (possibly on the Sabbath? ), but how are all of us who are in different positions in the world going to meet Elijah and him be at more than one place at a time to lead us out. I guess I just want to believe that God is going to find me where I am and lead me out as I am walking circumspectly upright to him in holiness and truth. I definately do not want to be beheaded (but than again who does)! Case & Will: My book does give the instructions for repentance needed to be a part of the escape plan. You simply disagree on what repentance entails. I’m sure keeping any commandments that were given only to Ancient Israel and only found in the OT is not what “the commandments” in Revelation is referring to (Jesus never told anyone to keep Sabbath! Acts 15 as well precludes this for gentiles http://www.wcg.org/lit/bible/acts/decree1.htm). It refers to only the commandments that are possible for people today to be convicted of. Ancient Israel had priests and prophets and judges teaching and convicting them of their own set of commandments. Not everyone of all ages and places has the same set of commandments. E.g., Adam and Noah had to be fruitful and multiply. We do not. If you personally want to keep Sabbath then that’s great, you will be blessed. However I do not find any evidence (or way) God wants all mankind to keep it today to be acceptable in his sight. Angelique, if you are concerned and reading your Bible and watching there is no way you will miss what God is going to do. God does not say how, but we can be sure in this age of global telecommunications he will be able to get the word out to all of his people he will command to flee Babylon. Your comment about the Sabbath is an abomination in itself. You of all people cannot say that Jesus ‘never told any one to keep the Sabbath.’It just means you do not know how central the Sabbath is in God’s Plan for salvation.Israel messed with the Sabbath and God punished them,Ezekiel 20:11-12. Hebrew 4: 9-11 says the Sabbath remains for the people of God. Jesus did keep the Sabbath, afterall it was his own day for he is Lord of the Sabbath. Thanks you. First, please tone it down as there is no need to sensationalize each others statements. Second, if Sabbath is required for salvation as you say then how have people in history known which day was Sabbath and that they were supposed to rest on it? God had to show Israel the day with the miracle of manna and through Moses, a prophet speaking his words, what to do on that day. We have no prophet over us today so people even believers naturally work on Saturday like other days with a clear conscience. I hope you can see that your doctrinal theory would condemn practically all of humanity in history to damnation. Even today, people who read the Bible see that the Torah (which introduced and contains the Sabbath rest command) was only given to Ancient Israel and that in Acts 15 Gentile believers were specifically told not to worry about Torah. Why? This was directly in response to people teaching things like you are that the Torah was required for salvation (and Sabbath is part of Torah only). See http://www.wcg.org/lit/bible/acts/decree1.htm for more on this passage. In Mathew 19, what commandments was Jesus referring to when He told the rich man to keep the commandments in order to obtain eternal life? John, That’s easy. Just keep going from Mt 19:17 to the next two verses Mt 19:18-19. Those commandments are the only universal ones of God that all men could know and learn to keep without having a Torah or Bible. The Torah was not ever about salvation, but about national greatness. Those six existed before Torah and continue after, unlike the rest of the Torah, and unlike the rest of Torah, people will readily teach you them when they don’t like it how you broke those commands! Tim, according to Christ’s own words in Matthew 5:17-19 and many other places in the bible, teaching people to disobey God and ignore any one of His 10 commandments can cost one eternity. And many take that risk because they don’t want to lose their ‘social status’ or ‘academic standing’ or in general, they want to gain the things of the world. Otherwise, what can be so more clear than God commanding anyone who claim to love Him to keep His commandments, all of them? When one try to ‘abolish’ the 4th commandment, they also break the 9th because they bear false witness against the Apostle Paul and God Himself, since they claim Paul and Christ wrote the Sabbath is no more to be kept Holy. Both Paul and Christ kept the Sabbath Holy and taught others to keep all the commandments of God, if anyone claims to abide in Jesus Christ the Righteous! Bete, I’m not abolishing anything or teaching against doing anything. The ten commandments were given to Ancient Israel as part of the Torah and covenant he made with THEM. You can’t hijack the audience of that book and make it universally applicable to all. That’s all I’m saying. You mention Paul and Jesus. You seem to assume they did what they did out of universal commands. Did you know that Paul and Jesus were Jews growing up in a Jewish Sabbath-keeping culture? That’s why they kept Sabbath. Again, if Sabbath were a universal command, how would anyone know? And keep in mind that this universal command required death for breaking it. Why if there is a command is God no longer enforcing it OR sending prophets to warn people not to break it on penalty of death like before? Answer: It was given to Ancient Israel under the Old Covenant which they broke and ended. That’s why a New Covenant must come to replace the one that is waxing old. If you wish to keep Sabbath, then go ahead. But please don’t say people must do it or they don’t know Jesus. That’s inflammatory. Ok, now I understand where you are coming from. So you are under the impression that the remaining 9 commandments are universally understood and hence they are the only once that are expected to be kept? If that is the case, you will be surprised how many cultures consider many of those commandments alien to them. Or are you also advocating there is no commandments to keep at all? I agree that God will judge my cave dwelling ancestors according to what He put in their heart (the right and wrong). Romans 2 puts it very well. However, this generation or previous generations who heard about Jesus Christ have no excuse not to know who God is and what He commanded. Specially this generation has everything under our finger tip to learn what God wants us do as His followers. There is no excuses in neglecting to worship God for who He really is – the maker of the heavens and the earth and everything in them. Any one who has heard about Jesus Christ has heard also He (Jesus) created the heavens and the earth in 6 days and He rested on the 7th day and made that day Holy. Those who pretend to love God by celebrating His ‘birthday’ have no excuses for neglecting His real Holy day. By the way God made the Sabbath Holy long before a Jew came to the picture. To know and admit that God is the creator of all things doesn’t require one to be a Jew. When one admits that God alone created the universe, one will naturally find out which day He sanctified and made Holy as a sign of His creative power. All God reminded people (by way of the Jews, as it was them who were selected as a conduit to the real deal) about was that He wanted us to remember keep Holy that day He made Holy from the beginning (genesis 2:1-3). Wait a minute in Genesis didn’t our Father himself say that he ceased from His work on the seventh day and sanctified it, don’t you think He would have shared that information with Adam. Besides in order for us to know what took place at Genesis wouldn’t someone from the beginning have had to know these details and passed them down to the next generation. So, I think they would known about the Sabbath from the beginning. Again just my opinion. For me it is not that complying with the commandments brings salvation, that is only through Yeshua/Jesus. However Yeshua/Jesus taught If you love me you will keep my commandments. It is because I love Him and am so grateful that He loves me that it is not a burden but a blessing to honor His word. Genesis 2And on the seventh day God ended His work which He had done, and He rested on the seventh day from all His work which He had done. 3Then God blessed the seventh day and sanctified it, because in it He rested from all His work which God had created and made. Nelson, Thomas (2009-02-18). Holy Bible, New King James Version (NKJV) (p. 82). Thomas Nelson. Kindle Edition. Tim, I am aware that you have alot more knowledge of scripture than I do, so if you disagree with me just keep in mind that although I may be 60yo I am but a babe in Messiah. For this reason the Jews tried all the harder to kill him; not only was he breaking the Sabbath, but he was even calling God his own Father, making himself equal with God” – Who wrote that verse? John Wrote that verse and I believe John knew Jesus. The verse does not say that he was accussed of breaking the sabath, John wrote that Jesus did ineed break the sabath. No Tim you are wrong. Beta took the words out of my mouth. You say “universal” laws/commandments for anyone without having a bible. Why do you think the gospel will go throughout the world? It’s clear all throughout God’s Word, that breaking any one of God’s commandments brings penalties, consequences, judgement, death. Will you lose your salvation for working on the Sabbath? That’s God’s decision not yours or anyones to decide. The fact still remains, anyone who has heard God’s Word needs to show their love, respect and reverence to the King by honoring God’s Holy day the Sabbath. So yes, you are also breaking the 9th commandment bearing false witness by telling people the 4th is not a universal commandment. It becomes universal to anyone, the minute it is taught to them 🙂 Instead you should be spending this valuable time to educate people on the importance of obeying the 10 commandments, not discrediting any of them. We could debate this nonsense for a lifetime if you want to walk in disobedience and arrogant non reverencing, ignorance and prove my point by showing you that if what you say were truth, then watch what happens when someone teaches a child that lying is ok or that stealing is ok because they are in need. Child will grow up breaking many of the “universal” commandments and never know the difference between many “right and wrongs”, because you gave them improper guidance and teaching…Hence the reason God is making sure His Word be spread to all the world, so everyone can walk in perfection by not breaking any of God’s perfect commandments that holds all life and creation in the palm of His perfection which ends with a perfect rest day! We also can’t forget that sin was encouraged by the enemy so we would fall and it is the plans of the enemy to keep the Word out of the hands of those in need of it so that more parish for a lack of knowledge. This is why we must seek truth and resist the enemy at the same time. I’m just an average whiteboy American who works in the union and get paid good money working Saturday but I too am being reminded by the spirit of truth to forget the overtime money on Saturday, and enjoy a real paycheck of rest my King in Heaven has blessed me with to obey, that I may receive the blessings of obedience. Whether it is a “universal” law or not, if you have heard it and you love Him, YOU ARE COMMANDED TO OBEY IT! PERIOD! JEW OR NOT! God bless you with the spirit of Truth only to be used in truth and righteousness! James, the ten commandments were taught to ancient Israel, not anyone else. Even though you have a privileged life and can now eavesdrop on what God told them, most people in history and today have no idea or clue about the Sabbath. So how can it be a requirement? It was only a requirement for the nation that were shown through miraculous manna what day it was. You can’t hijack a text and redirect it from one ancient people and apply it to anyone eavesdropping on it today. In fact, the Bible commands nothing to anyone. When you say “it commands us” or “YOU ARE COMMANDED” by it, it shows a grave misunderstanding of what the Bible is and its purpose. It’s a book of histories, prophecies and letters profitable for gaining wisdom. But it’s not a law book or a rule book. Again, if it is a law book for us all, why has it only been widely available for 5-10% of human history? Tim, thank you for clearing up what was for me some “difficult words of Jesus”. The idea that it will be on a wintery sabbath day that the abomination of desolation is revealed makes perfect sense. Running for your life (as in a Tsunami approaching) will be the only way if you’ve procrastinated until then after hearing Elijah’s warning. My only question: is there anything written that indicates whether it’s a weekly sabbath or an annual sabbath? Yeah I love this insight when I got it from Benjamin Baruch early in my studies. Glad it’s helping. Well, I’d be curious to see if you could back up the idea that first century Jews lumped both 7th day Sabbath and the feast days under the heading “a Sabbath.” I mean I know they are all “These are my MOEDIM/feasts” but I don’t think it’s true they are all sabbaths or referred to in that way. I seem to remember Nehemia talking about this on Karaite Korner once that the only holy day like a sabbath with no work at all (rather than a restriction on only “servile work”) is Yom Kippur. Also is travel restricted on any other feast day than Yom Kippur? The focus of the passage is travel obstacles. The weekly Sabbath is known for that, other moedim, not so much. Anyway, for these reasons, I’ve never been confused by what “Sabbath day” refers to in Mt 24. Let me quote a good teacher, as he made reference to the old covenant, with a new perspective and understanding of Christ’s impact on the “New Covenant” Mark 2:27 Then he said to them, “The Sabbath was made for man, not man for the Sabbath”. I feel that the Sabbath should be kept, but clearly, keeping the Sabbath does not separate the wheat from the chaff. All the commandments were created for man, not man created for the commandments. But stating this does not mean every command of God is universal, for mankind. The Sabbath so far has only been given to one nation: ancient Israel. In the Millennium under the New Covenant (Jer 31:31) it will be finally given to all nations (Isa 66:23). Until then, it’s a grave error to take on commands that were never given to you as it tends to make you lose focus off the ones that were given to you and to all, just as Acts 15 demonstrates so well, as does the modern Hebrew Roots Movement with its lack of love (John 13:35).